Our Sun has been burning brightly for currently about 4.5 billion years and will continue to do so for another 7 billion years or so. A photon from the surface of the Sun takes about 8 minutes and 20 seconds for it to reach the Earth; 500 seconds to travel about 150 million km. Inside the Sun however, it takes many thousands of years for a photon to get from the core to the surface. As the Sun is only about 700,000 km in diameter it should only take a photon traveling at the speed of light about 2.3 seconds to travel that distance. So, why does it take so long? Studying the inner anatomy of the Sun, itʼs density and processes, is the only way to come to understand why it takes as long as it does for a particle traveling at light speed to move such a short distance. When studying the Sun, only the very surface is actually visible leaving everything below invisible and thus theoretical. Although studying below the surface of the Sun may be difficult there are decades of data to draw from and through the use of different simulations of theoretical models astronomers have been able to make what is referred to as the “Standard Stellar Model” allowing the Stellar Structure to be understood. 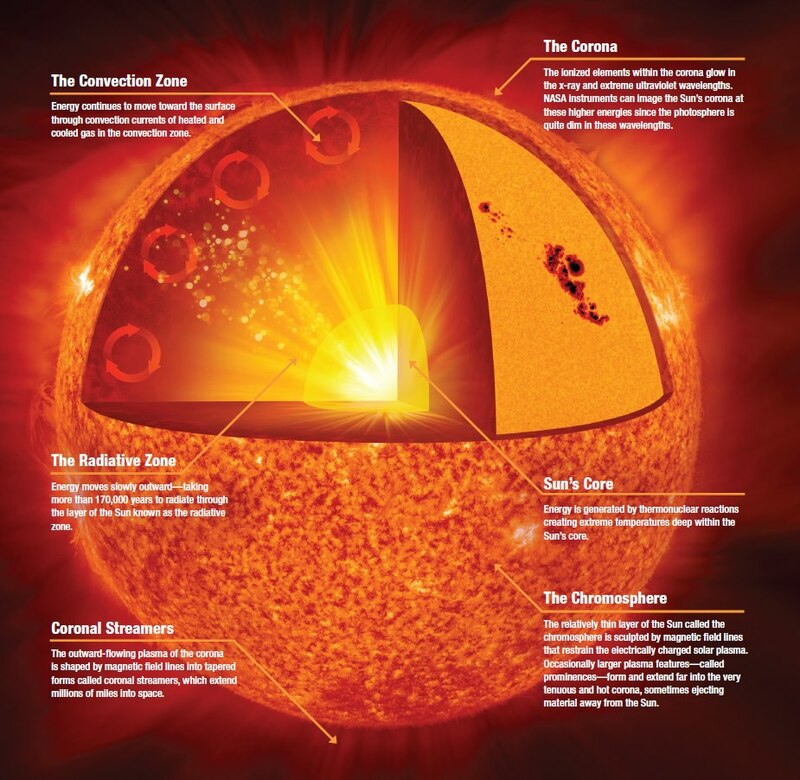 The core of the Sun is where the nuclear fusion takes place and where the energy output that keeps the Sun from collapsing under the influence of gravity comes from. 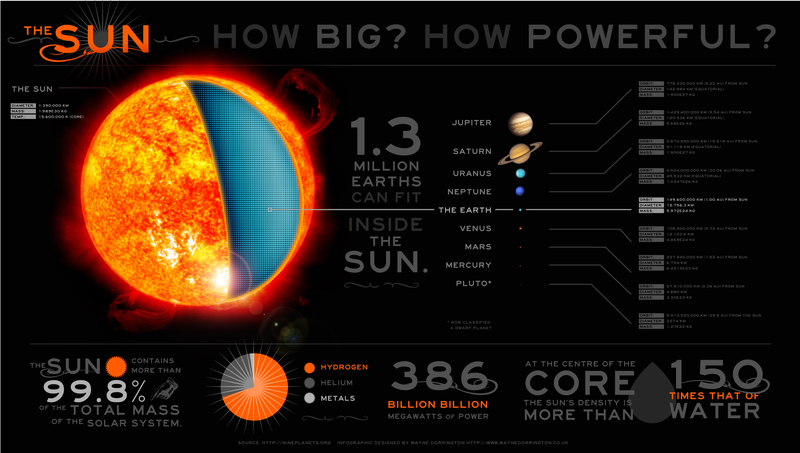 Although the core takes up the inner 25% of the radius it only contains 2% of the overall volume but because of the very high density it contains 40% of the Suns mass. The next step out is the Radiative Zone. All of the energy generated in the core of the Sun has to work itʼs way through the Radiative Zone by photons being absorbed and re-emitted over and over again as they make their “Random Walk” towards the Convective Zone. As there is no fusion in the Radiative Zone, the average temperature is only about 4 million Kelvin. This zone extends from the core (25% radius) out to the Convective Zone (70% radius) where the temperatures range from 8 million Kelvin nearer to the core to as low as 2 million Kelvin around the Convection Zone. The Radiative Zone is the largest part of the Sun with 45% of the radius, 32% of the volume and 48% of itʼs mass. The last of the main shells is the Convective Zone and this takes up the last 30% of the radius or approximately 200,000 km. Over those 200,000 km the temperatures ranges from 2 million Kelvin near the Radiative Zone and gets to a cool 5,700 K on the solar surface. As the Convective Zone is far cooler than the rest of the Sun, especially nearer to the Suns surface, some of the heavier elements such as Nitrogen, Carbon, Calcium, Iron, and Oxygen are no longer fully ionized which makes the outer layer more opaque. This is how the convection occurs, pockets of heat store up and then rise to the surface like water boiling on a stove. A photon begins itʼs life in the core of the Sun as a gamma-ray through the P-P Chain. Without going into too much detail the P-P Chain is the process that the Sun uses to produce energy. This is nuclear fusion where Hydrogen is fused together to create Helium and a lot of energy. Due to the density in the core of the Sun a photon is not able to move very far before it interacts with another atom. When a photon hits an atom it is absorbed and re-emitted in a random direction, hence the name for a “Random Walk.” This “Random Walk” also goes by the name of the “Drunken Walk” because a drunkard stumbling around a street in an attempt to not stumble will make turns in random directions. Although I’ve left all of the messy mathematics out, I calculated that while traveling at the speed of light, that photon would take about 264 years for a photon to travel from the core of the Sun to the Convection Zone. This calculation is based on the average distance (that is displayed in most text books) that a photon will move before being absorbed and re-emitted. Here lies a dilemma. Most text books put the time anywhere between 100,000 years all the way up to 50 million years. So, if from the results above, it takes about a quarter of a millennium to get through the densest and largest portion of the Sun, why is there such a large difference? Obviously, the Mean Free Path (average distance a photon will travel) must be far shorter than 1 cm (1 cm being what is generally quoted in text books). The final main zone of the Sun is the Convective Zone composing of only 30% of the radius but 66% of the Sun’s volume. As the name suggests, photons in this part of the Sun no longer move through radiation part, particle to particle, but through convection. Within the Sun convection is able to occur because of the great decrease both in temperature and density. The best illustration to describe this is a boiling pot of water. As the bottom of the pot is heated eventually there are cells of hot water that rise to the surface, these are the observed bubbles. 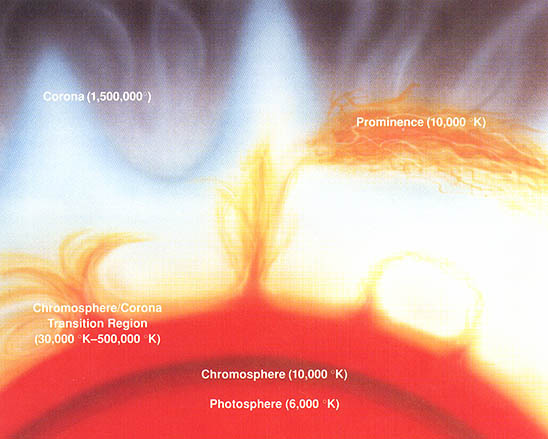 This is the basis of how the Convection Zone operates, plasma from the inner part of the Convection Zone heats up which makes it more energetic and then rises towards the solar surface carrying that energy. Energy is gradually deposited along the way to the surface, at which point it will have cooled dramatically. 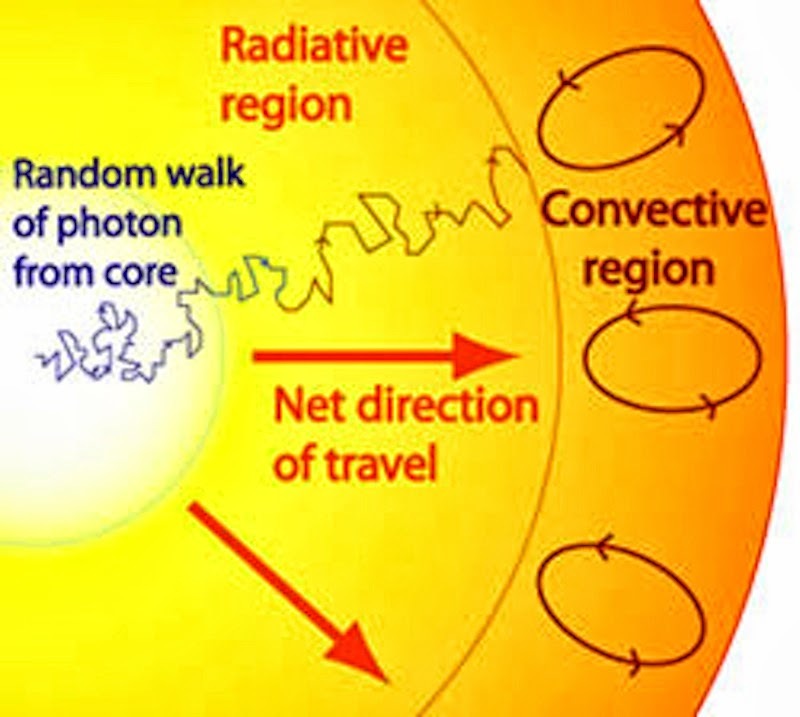 It is well reported that it can potentially take upwards of a million years from a photon to take a “Random Walk” through the Core and Radiative Zone, but how long in the Convection Zone? One source states that it may only take about 10 days to travel the 200,000 km journey. Comparing this means that almost the entire lifetime of a photon is spent in the inner part of the Sun, bouncing around and barely moving. The last section of the Sun that a photon spends time in before commencing an eight minute journey to the Earth is in the Photosphere. The Photosphere is only 500 km thick so compared to the rest of the Sun, it is very thin. The temperature range of the Photosphere also doesn’t have very large numbers, ranging from 6400 Kelvin at the bottom to only 4400 Kelvin at the top. Most of the light that is visible from the Earth is emitted closer to the bottom of the Photosphere which is why the Sun has a said temperature of 5780 Kelvin, the temperature closer to the bottom rather than near the top. The last leg of a photon’s journey is the actual trip to the Earth. This is furthest part of a photons trip but also, ironically, the fastest. Since there is nothing to slow down the photon on the journey between the Sun and the Earth a photon is finally able to move at the speed of light. This works out to a time of 500 seconds or 8 minutes and 20 seconds. It can be hard to imagine the time scale that it takes for a photon to travel a relatively short distance, or how the longest distance is traveled in the shortest time. This goes to show is that density is the main determining factor for the distance of the Mean Free Path of a photon within the Sun. Most web sites and text books put the Average Mean Free Path of the Sun as being 1 cm but as shown above, with that number it would take far less than the estimated 100,000 – over a million years to make the journey. The reason for this is simple: with all the time dedicated to more important studies, trying to calculate the exact time it takes a photon to make itʼs “Random Walk” through the Sun is not high on the priority list. 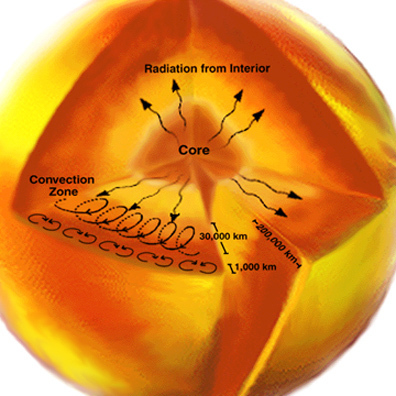 The Demon Core: Appropriately Named? Could Airplane Mode Improve Our Quality of Sleep?